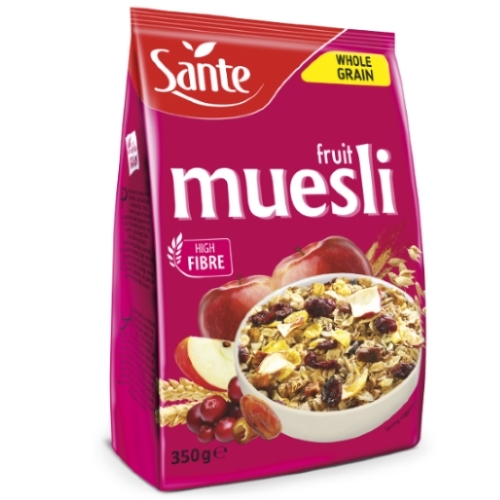 Sante Muesli tropical, created according to a new recipe, is a delicious mix of roasted and raw wholegrain flakes and large pieces of fruit: dates, pineapple and papaya. 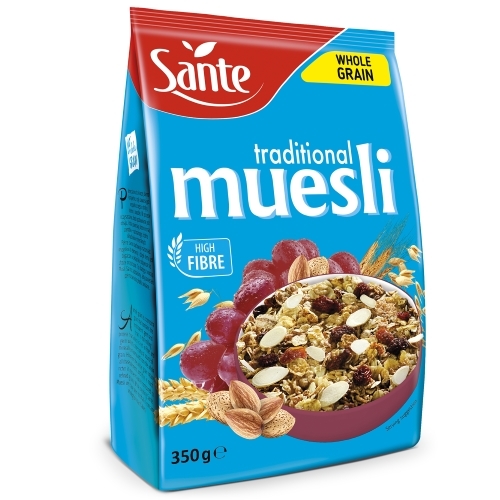 It is the only Muesli with crunchy flakes added. 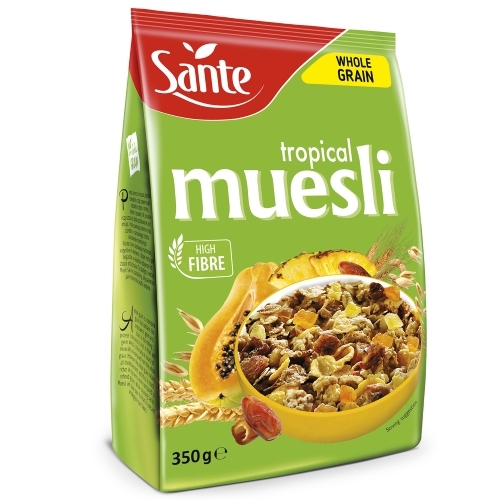 Sante Muesli tropical is ideal for a delicious breakfast. It tastes great with milk, yoghurt and kefir. Cereals flakes 73% [whole grain oat flakes 32%, barley flakes, wheat flakes (wheat, unrefined cane sugar, sea salt, barley malt extract), corn flakes (maize grits, unrefined cane sugar, sea salt, barley malt extract)], mix of fruits 16% in variable proportions [dried dates (dates, rice flour), candied pineapple (cane sugar, pineapple, acidity regulator: citric acid), candied papaya (cane sugar, papaya, acidity regulator: citric acid)], flour: barley, maize; glucose syrup, unrefined cane sugar, non-hydrogenated palm fat, maize grits, cane molasses, coconut flakes, sea salt, barley malt extract, cinnamon, flavouring.